This was one of my most interesting illustrations I've done yet. I say this because the shoppe itself closed down a few years and is now an online store (http://www.makeyourowncosmetics.org/ and http://www.aromashoppe.com/) where many of the same things from the physical Aroma Shoppe were sold. So instead of working from a bunch of photos I took I worked from photos taken in the past by others. It was certainly a challenge but it was fun all at the same time. Expect more drawings of this shoppe in the future! 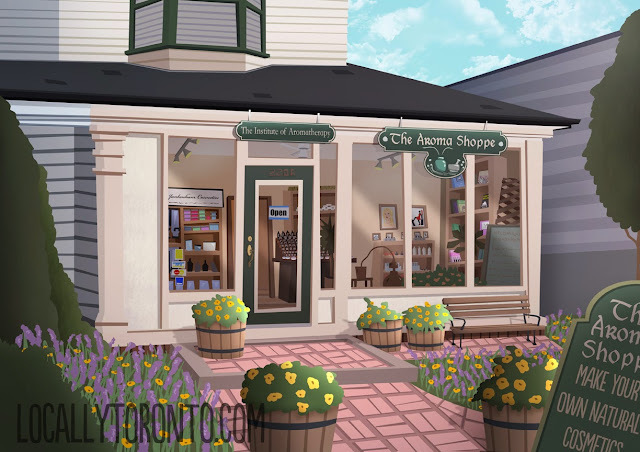 It is realistic and my Toronto customers remember the shop from the picture very well. It was an International school as well as a shop with students travelling from all over the world especially Japan to train in Aromatherapy and Holistic Studies. I loved this shop! Remember it well - remember Jan as well.